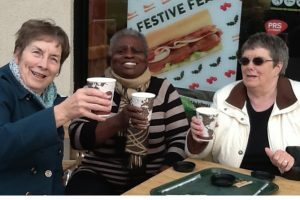 The Social Activities sub-Committee organise visits and outings which are open to all members of Eastwood & District U3A. Visits being planned for 2019. Steve and Pauline. 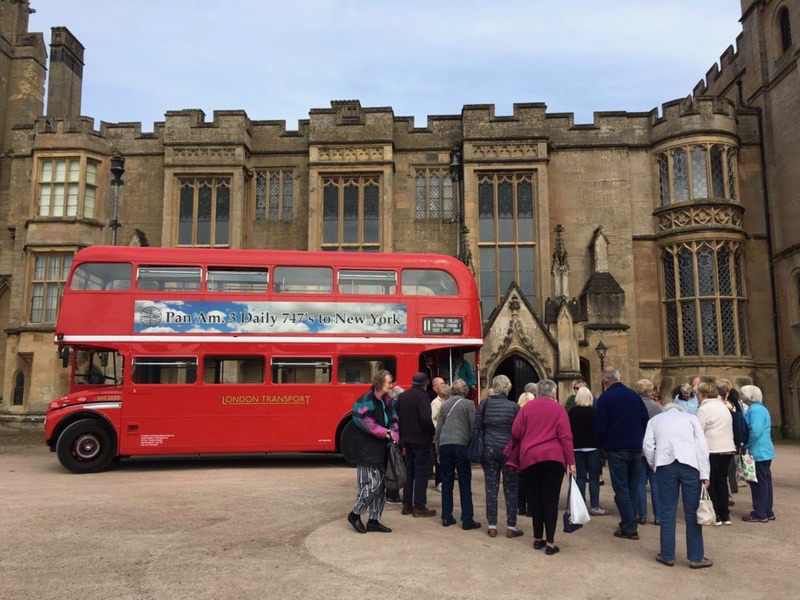 On May 17th32 members of our U3A boarded a bright red vintage double decker London bus and headed to Sherwood Forest. Our Guide Andy was extremely knowledgeable and gave us facts about the area and the ancient forest its heroes, villains, kings and of course the legendary Robin Hood. The first stop was Rufford Abbey where we enjoyed coffee and cake before a tour of the remains of the Cistercian Abbey. Then it was back to the bus and on to Sherwood Forest to see the Major Oak and enjoy a walk in the woods. 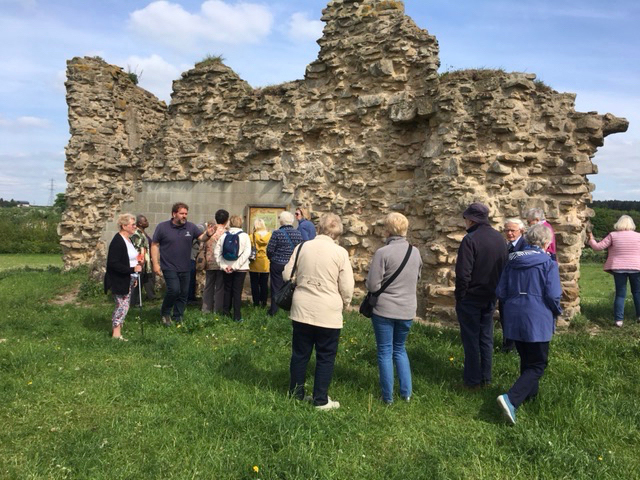 After lunch we made our way to Kings Clipstone to see the remains of King John’s Palace before our final stop of the tour, Newstead Abbey once the dwelling of the Augustinian Priors of Sherwood Forest and a well earned ice cream. It was a really fascinating fact filled day enjoyed by us all. Lorna Stirland. 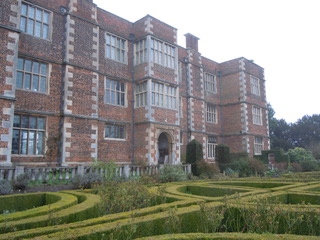 We had a very interesting trip to Doddington Hall near Lincoln the home of the same family since the Hall was built in 1600, although the family name has changed five times due to it being passed down through the female line. 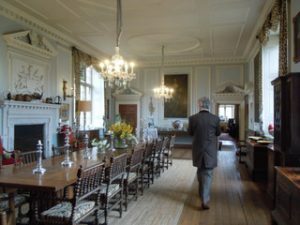 We were taken on a conducted tour of the main rooms and were most interested to see the work being done to preserve the tapestries from the Yellow Bedroom originally hung in the 1760s. This work was taking place in the Drawing Room by three young lady Conservators who had already worked on tapestries from the Holly Bedroom now rehung and certainly looking “fresher”. We also saw jars containing some of the nails and soot that had been extracted from the tapestries during the cleaning process. Some of us were able to have a quick look round the gardens before the cold weather drove us into the cafes and wonderful Farm Shop, which would be well worth visiting at any time, along with the Bike Shop, Clothing and Home shop etc. 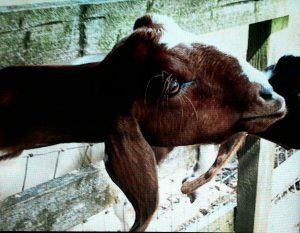 Visit to Adams Cotswold Farm Park 18th July 2017. 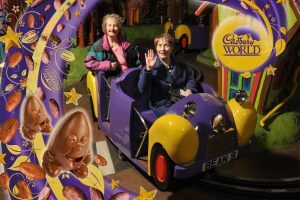 On Thursday 16th February 2017 a group of U3A Eastwood members joined together at Morrisons Eastwood and took a coach trip to Cadbury World in Birmingham. 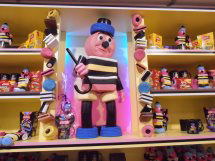 We arrived at the venue after a 90 minute journey and were taken into the main factory building where we were confronted by a massive sweet shop which showed every product they make in wonderful displays. They even had a miniature railway engine running round at ceiling level, plus a nice cafeteria to one side. 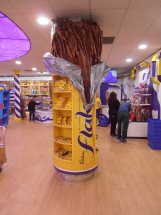 We continued into the main exhibition centre, through different aspects of the world, to a setting of the shops in London where they began the chocolate company. 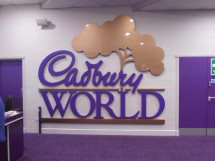 Next we saw a film describing the methods of making and producing chocolate. We then went on through more passageways to see how the moulding is done etc. We also sampled the chocolate and mixings. On to a window view of a factory sweet room; we continued down more passages to a tunnel ride in an electric car, passing marvellous displays of the cocoa bean and ending in a snow and ice arctic scene. Some of us then went round the village and gardens. The main school tower, with its collection of bells, was interesting, as was the museum house. Opposite was an old property that had been moved a mile to its present position with a treasure trove of interesting antiques etc on three floors. 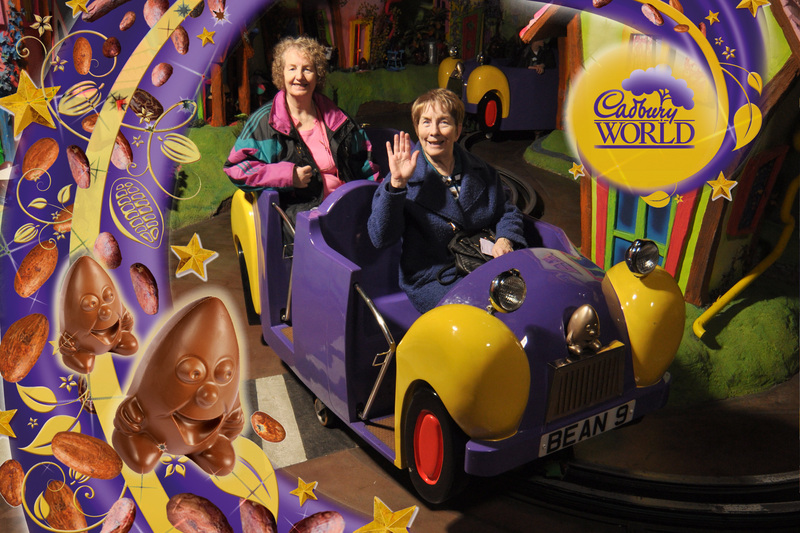 Joan and Jill enjoying their time at Cadbury World. What a wonderful feast of entertainment we had at the beginning of December. We travelled to a fabulous hotel on the sea front in Yarmouth. The weather was great for the time of year. The Christmas Extravaganza Show at Thurlsford was a magical show with choirs, dancers and orchestra in great costumes. There must have been nearly one hundred different entertainers in the show. On the way back we stopped at Springfield Shopping Centre where we managed to pick up last minute Christmas presents. The three days were wonderful. Highly recommended. 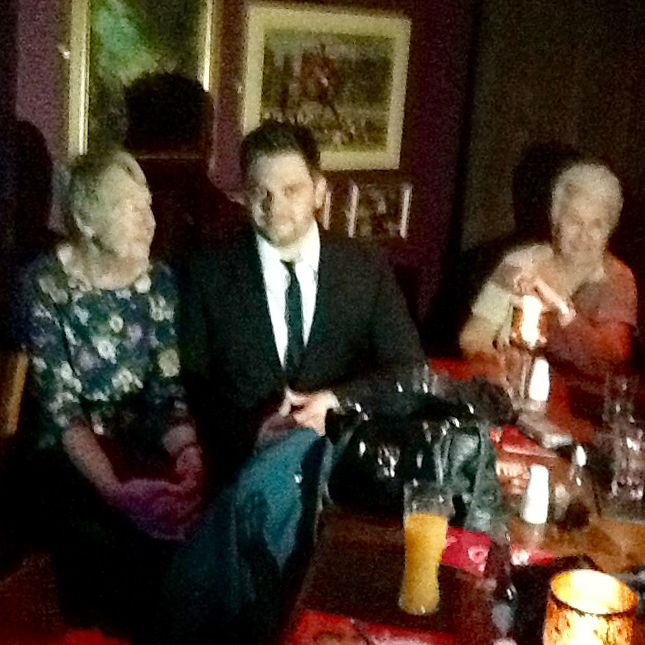 An evening with a Michael Buble tribute act – November 27th,2016. A small group of members visited the Junction at Sutton in Ashfield for a meal and an evening of entertainment from a Michael Buble tribute act. It was a very good, enjoyable evening. 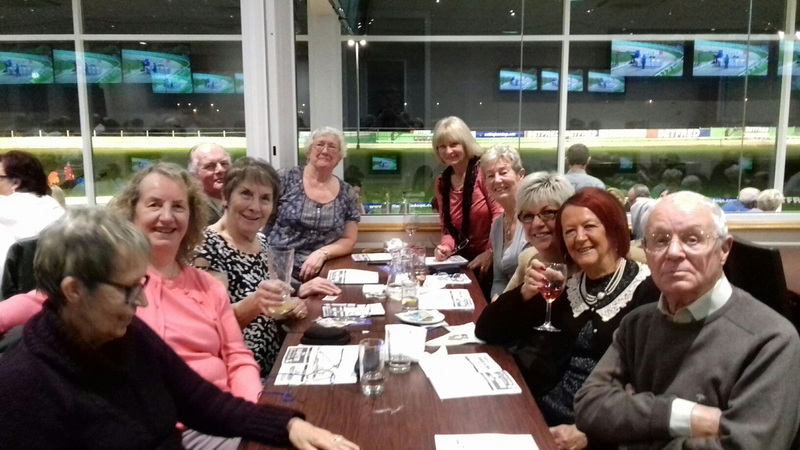 Visit to Colwick Greyhound Stadium – November 18th, 2016. 12 of our members enjoyed a night at the races. We went dog racing at Colwick. We were all impressed with the meal. Most had winners some more than others. It was very relaxed with waitresses fetching your bets so you could sit and enjoy the meal and racing. 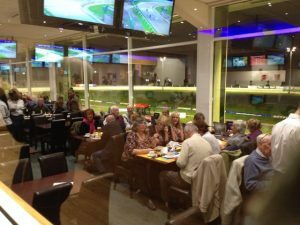 The track was visible through the window, but there were screens everywhere so no matter where you sat you could enjoy watching your dog win…or not. We would all like to go again and am sure others would also enjoy a visit. Visit to Castle Howard, Yorkshire. 11th October, 2016. In October we had a lovely outing to Castle Howard in East Yorkshire. The Howard family has lived there ever since it was built over 300 years ago. Successive generations have welcomed visitors to the house. They say it is only with the support of the visitors that make it possible to continue the endless task of restoration and conservation. There is so much to see; the house, gardens, beautiful lake, Garden centre, and children’s play park. It is an interesting and beautiful place. We were shown various areas that had been used for filming scenes in TV productions and films. Beautiful views of the surrounding estate can be seen from the house. There was a little land train to take people with limited mobility around parts of the estate. It would be great to go again in the summer and take a picnic. 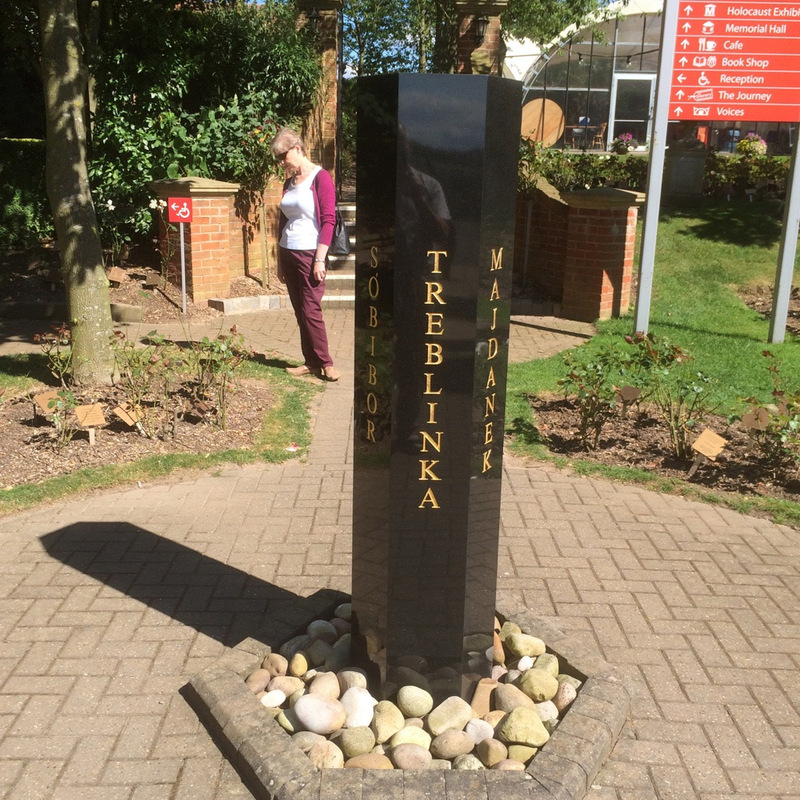 Visit to the Holocaust Centre, Laxton. In 1933 prior to the war the U.K. government agreed to take 10,000 unaccompanied children from Germany and Austria on what is now known as the Kinder Transport. Following a very informative visit to the Holocaust exhibition, 29 members of our U3A had the privilege of spending time listening and talking to Howard Kendall, himself an Austrian Jew who left on one of the trains. One million other children never survived. The white rose bushes planted in the memorial gardens represent people who perished in the holocaust. 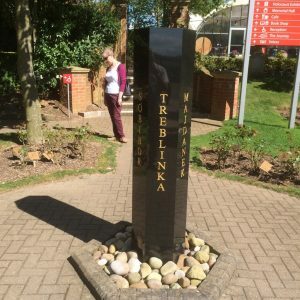 The plaque at one rose bush indicated the loss of 81 members of one family. The white rose symbolizes the struggle started in 1942 by Hans and his sister Sophia with their friend Christoph Probst against the atrocities being carried out by the Gestapo under the instructions of Adolph Hitler. Bridlington and Bempton Cliffs – June 16th. Report & photo by John Stirland. On a wet Thursday morning 38 members of the Eastwood U3A set off on a coach trip to Bridlington. Members of the Birdwatching group had joined us and they continued on to Bempton Cliffs for a few hours with the sea birds. On arrival the clouds parted and we were set fair with blue sky. It was a time to go back to childhood days at the seaside, enjoying a paddle, fish and chips, buying rock and the obligatory ice cream or waffle. The birdwatchers rejoined the rest of us with wonderful shots of the sea birds, a good day had been had by all, another very successful visit, thanks to our Social Committee. Oh what a ‘blooming’ trip! On Wednesday 11th May, I joined other members of the U3A on a trip to Lea Gardens. The display of rhododendrons was spectacular. The rail had just stopped and drops were still clinging to the exotic blooms. I felt that I had just entered some beautiful garden of paradise with flowers of the deepest red, sunburst yellow, the purest white, angel pink and alluring violet. Some were even scented. We spent time in their garden shop where some purchases were made and had a drink in the café before moving on to Matlock. Some members went to Matlock to view its antiques shops and view the open market. 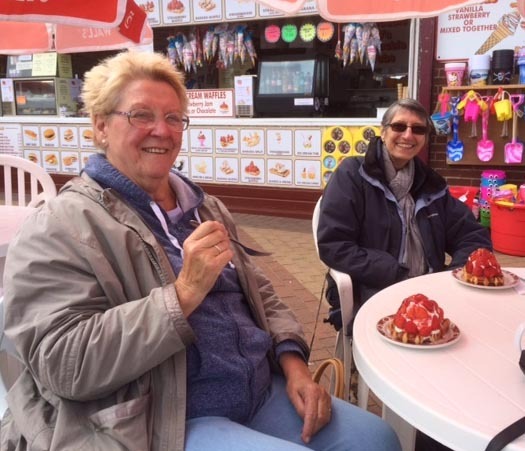 Another group stayed in Matlock Bath and enjoyed the river and its shops. 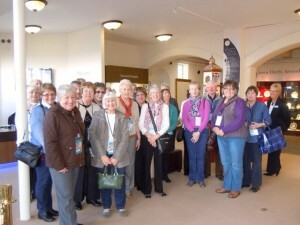 I joined a small group and went up to The Heights of Abraham on the cable cars. The views from the summit were breath taking. For the fitter amongst us, a trip into The Great Masson Caverns was a must. It was an underground experience into the great chamber and through the hillside. For those of us that couldn’t venture through the caverns, a living reality film show was showing, so we did not feel that we had entirely missed out. We viewed the Victoria Prospect Tower and enjoyed time in the Tree Tops Visitor Centre before we had to make our way down again to the bus. Meadowhall. 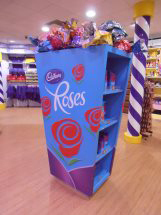 Friday 15th January 2016 – for shopping and cinema. Birmingham Christmas Market Visit. Tuesday 8th December, 2015. Royal Crown Derby. 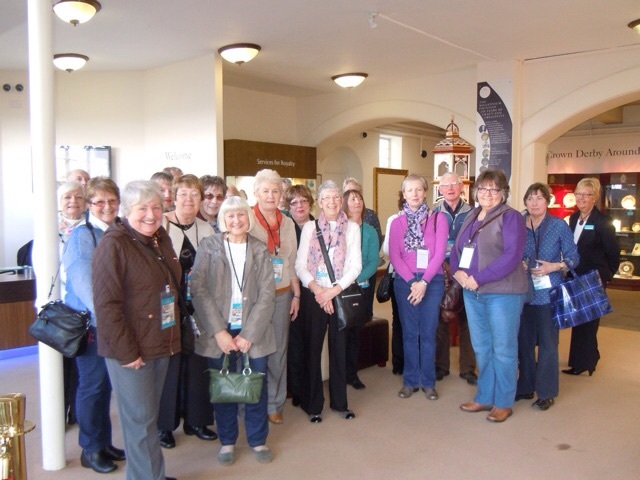 On 24th March, 2015 28 members enjoyed a guided tour of Royal Crown Derby. It was fascinating to learn all the technicalities of the manufacture and to see the workers in action. The café was also appreciated with pretty china and tea strainers; a step back in time to a more gracious age before tea bags and mugs. Made in Mansfield Exhibition. 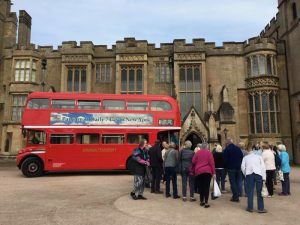 Several members travelled by Black Cat bus to the Made in Mansfield Exhibition at Mansfield Museum on November 6th, 2014. The visit to the museum was followed by a meal. Beauvale Priory. 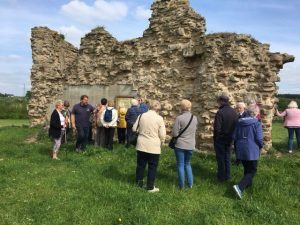 In October 2014, 28 members had a Talk and Tour of Beauvale Priory, followed by afternoon tea at the Gatehouse Tea Rooms. New White Bull, Giltbrook. The first event organised by the Social Sub-Committee was an introductory get together at the New White Bull, Giltbrook on 5th September, 2014. This was very well attended and members talked about different ideas for future events.